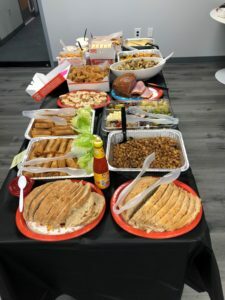 This year, the Brillient BEST (Brillient Engagement and Service Team) put on a Thanksgiving Potluck, where everyone in the office was invited to bring in their favorite holiday dish. 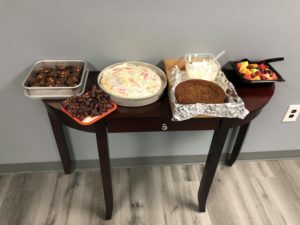 The team showcased their eclectic tastes in food by bringing items like cornbread, fried chicken, stuffing, eggrolls, ham and confetti cake. Team members enjoyed the sounds and sights of a roaring fire- on the big screen TV of course, and the delicious and savory meal we shared together. 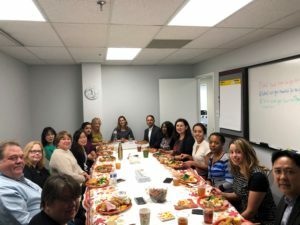 After everyone filled their plates a first- and second time, we went around the room and explained which dish we brought in, what we are thankful for this year and what our favorite Thanksgiving tradition is. 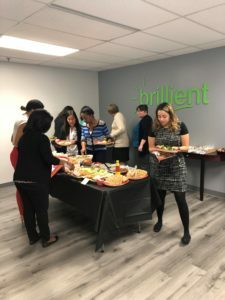 This has been a big year for Brillient Corporation and we have lots of things to be thankful for!